With its high power 25.2V battery, PJRC160 provides the fastest cutting speed for a cordless rebar cuttter in the market today. Thanks to the Li-ion battery technology, the PJRC160 cuts approx. 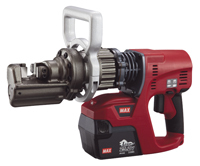 176 cuts per charge, Most Powerful in its class. The brushless electric motor offers higher efficiency and longer lifetime. Sparks free rebar cutter increase worker safety.